CAPTION: Yup, he actually did it…and lived to tell the tale. …sometimes work as director James Marsh and subject Philippe Petit prove in the sublime and inspiring documentary, Man on Wire. Here we see Petit and his cohorts recklessly plan and execute the most daring stunt in the history of the world. 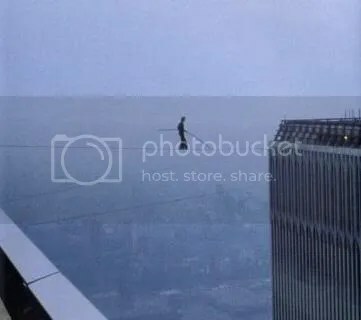 In August of 1974, Petit walked a tightrope between the Twin Towers of the World Trade Center in NYC. As part of Hollywood’s increased awareness of the possibilities of counter-programming, summertime has become a haven for documentaries. Thanks to Michael Moore and Al Gore, most of the blockbuster documentaries over the past few years have been in the form of political propaganda. By simply wanting to tell the story of one man’s amazing act, Man on Wire breezes into this summer like a breath of fresh air. The act depicted is singularly focused, but the logistics behind perpetrating the act are fascinatingly complex, and the aftermath of the successful completion of the act is breathtaking. Director Marsh wisely avoids the typical trappings of documentaries by filming the story like a fictional narrative, jumping back and forth in time, shifting points of view, and creating palpable tension leading up to the death defying act of Petit walking across the wire. The film relies heavily on reenactments, and Marsh stages them like mini expressionistic student films full of stunning cinematography and wonderfully antiquated in-camera effects. The careful juxtaposition and blending of archival footage, still photography, reenactments, and interviews is a master-class in the school of film editing. Also adding to the film is the quietly tense music score composed of pieces from Michael Nyman and Erik Satie among others. For those who never saw the Twin Towers of the WTC in person, the film shows beautiful archival footage of their construction. For those still haunted by their fall, the film offers a bit of catharsis as we get to watch them reconstructed piece by piece on film and lifted again on high through Petit’s potently mad dream. The film is as much a love letter to New York City as it is a testament to the power of one person’s vision. The film allows us to see how Petit did it, but it also gives a glimpse of the greater “why?” For beauty, for the thrill…for the sad knowledge that no one in the history of the world will ever be able to do it again.